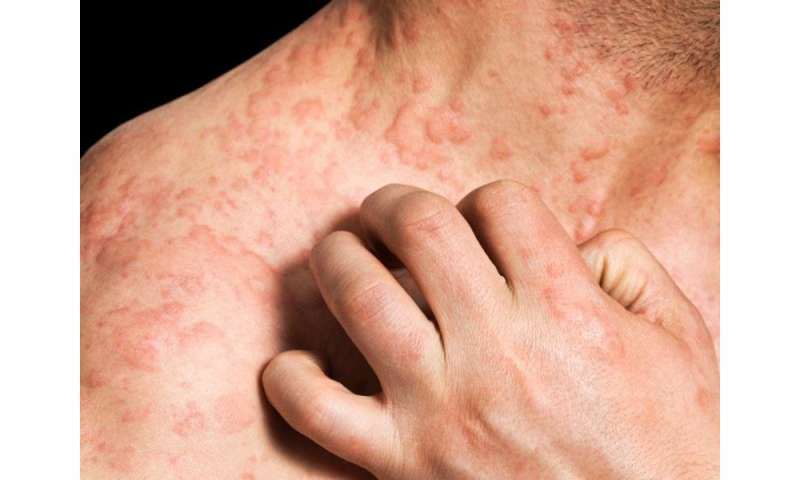 (HealthDay)—Patients with moderate/severe atopic dermatitis (AD) have higher patient-reported burden than those with mild AD, regardless of disease control, according to a study published online July 3 in JAMA Dermatology. Eric L. Simpson, M.D., from the Oregon Health & Science University in Portland, and colleagues characterized the patient-reported burden of AD in a cross-sectional study using data from six academic medical centers. Using the Patient-Oriented Scoring Atopic Dermatitis, they stratified 1,519 adults with AD by AD severity as mild or moderate/severe. Those with moderate/severe disease using systemic immunomodulators/phototherapy were further stratified according to disease control. The researchers found that the 830 patients with moderate/severe AD reported more severe itching and pain, greater adverse effects on sleep, higher prevalence of anxiety and depression (50.2 versus 27.3 percent), and greater health-related quality-of-life impairment compared to mild AD (689 patients). For patients with moderate/severe AD, higher burdens of itch and sleeping symptoms were reported for those with inadequate disease control despite treatment with systemic immunomodulators or phototherapy versus those with controlled disease; this included more days per week with itchy skin (5.7 versus 2.7) and higher proportions with itch duration greater than half a day (22.8 versus 2.9 percent). "Regardless of disease control, the burden of moderate/severe AD was higher than mild AD, suggesting a need for more effective therapies for moderate/severe disease," the authors write. Several authors disclosed financial ties to pharmaceutical companies, including Regeneron Pharmaceuticals and Sanofi, which funded the study.